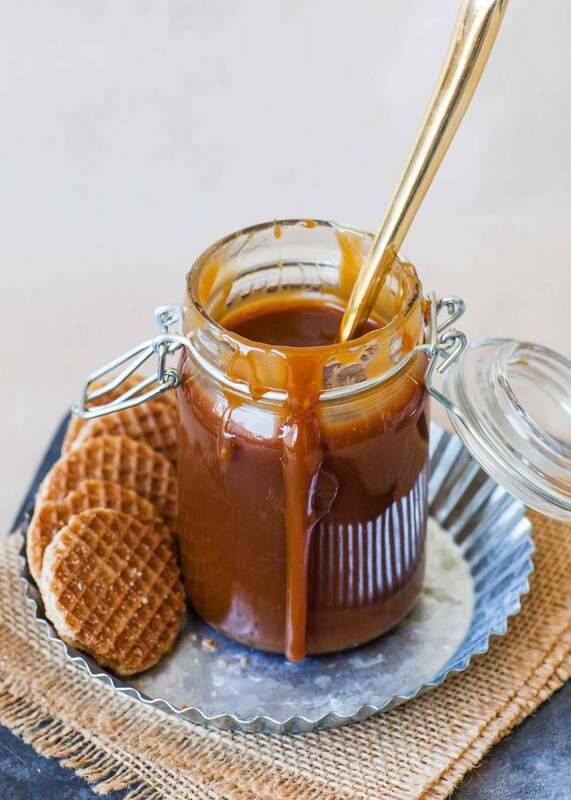 Easy, 6 ingredient recipe for the best caramel sauce recipe ever! Who doesn’t absolutely LOVE a good caramel sauce?! Have you ever tried making your own at home? 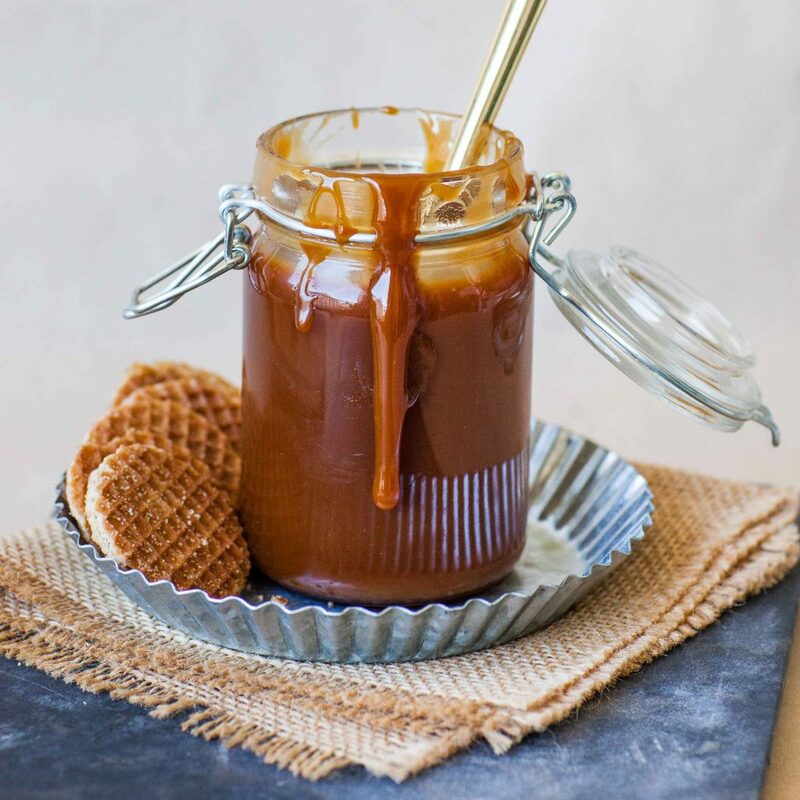 Making your own caramel sauce is super easy! And once you try it, you’ll never go back to the bottled variety. It’s perfect for drizzling over everything – coffee drinks, cakes and desserts. Make sure to watch my video recipe for step-by-step instructions! Want new recipe updates? Make sure to subscribe to my YouTube channel! DO NOT STIR! Just one simple rule that can make or break your recipe! If you ever get a grainy, sandy type of caramel sauce, that means the sugar didn’t melt equally as it was cooking. Once you mix together the sugar and water, don’t stir the mixture; just let it cook away. Also, try to use a saucepan that isn’t too big or too small for the mixture. Cook over medium heat, allowing the sugar to melt uniformly. Cook until the sugar caramelizes into a rich, brown color. The darker the color, the more intense the flavor. But be careful not to burn the caramel – no one likes burnt caramel! Add the vanilla and butter last, ensuring that the vanilla flavor doesn’t get cooked out of the sauce. Keep the ready sauce covered with plastic wrap so a film doesn’t form on top. I love to use my home made caramel sauce for my ‘Salted Caramel Buttercream’ in place of dulce de leche. I make the sauce the night before, then refrigerate it overnight. It thickens up nicely and can be used as a spread or for the frosting recipe! Enjoyed this recipe? Please save and share it to Pinterest for later! Here’s a similar stainless steel pot to the one I always use – so convenient! I love this sturdy All-Clad whisk – gets the job done well! If you ever need an extra burner, this is the one I use in all my videos. And these cute mason jars are great for storing the caramel! In a medium-sized sauce pan, combine the sugar and water but do not stir. Cook the sugar over medium heat for 15 to 20 minutes, until the sugar caramelizes into a rich, amber color. Do not stir the syrup while cooking, as this will cause crystals to form on the sides of the pan! The timing can also vary, depending on saucepan and stove top. Once the syrup caramelizes, add the butter and whisk until melted. Add the heavy cream next and mix again; the sauce will foam up - take care that it doesn't run over. Remove the sauce from heat and add the salt and vanilla extract. Allow the sauce to cool in the pan for 5 minutes, then pour into a glass mason jar for keeping. Keep the sauce at room temperature for up to 1 week, or refrigerate for a thicker caramel. I have made many of your recipes and have loved them all. Tried this Caramel sauce twice and didn’t turn out either time. NOT AN EASY RECIPE. I don’t think I will waste anymore sugar, butter, and cream. first time overcooked/burned. next under cooked. difficult to get the right amber before butter/cream step. disappointed. So sorry this recipe didn’t work for you! How do you store the caramel? I recommend placing it into a glass jar and keep it refrigerator for longer shelf life. It will be okay at room temperature for a few days. I have a ceramic stove, and I am doing this recipe at the 4 level for cooking. The first time it came out perfectly. The last two times it is not turning amber colored and the sugar is crystallizing into little pellets. I am not stirring and cooking it 15-20 minutes. Any suggestions? Amazing recipe!!! Turned out from the first try! Will definitely be making it again and again! my favorite caramel sauce recipe. Thanks Tatyana! I’d love to use this recipe as filling for cupcakes – do you think it would be better to do that at the room temp consistency, or refrigerated? Will it work if you don’t make it as dark of an amber color in the pan? Thanks! Hi! 🙂 Yes, this would be perfect as a filling for cupcakes. I would try it first with room temp sauce since it will flow easier. And the color/richness of the sauce is also adjustable; a lighter color will work just fine. I recommend having the cream and butter at room temperature, too 🙂 Enjoy! Sorry, 1 more question! Should the butter and cream be room temperature? Great recipe, thank you! It was enough to cover and drizzle two cakes. I had zero issues making it, and really enjoyed the flavor. To those using real vanilla extract vs imitation, I suggest using only 1 tspn, as the vanilla flavor can become overwhelming- though of course, it’s a matter of personal preference. I have just made this in preparation to make your Layered, Caramel Pumpkin Cheesecake for Thanksgiving. It took 2 tries to get the color right – I slightly burned the first batch and it was too bitter! The syrup actually started to brown in one spot, not uniformly. So it’s understandable how one area could burn before the rest of it is done. The second try is fine, truly delicious. I need to hide this overnight from my son or it will be gone before I make that Cheesecake tomorrow. Wish me luck, and thanks Tatyana. I look forward to trying more of your recipes! I’m so glad to hear that! 🙂 Enjoy!